Our products are handmade in our factory outlet in Waimea, Kaua’i. We use the finest passion fruit and pure Hawaiian cane sugar. Stop by and sample all of our products, including our Passion Fruit Wasabi Mustard and Passion Fruit Wasabi Dressing. Both of these very special products are multiple award winners at the International Mustard Competition in Napa Valley, California—including the coveted Grand Champion trophy in 2005. 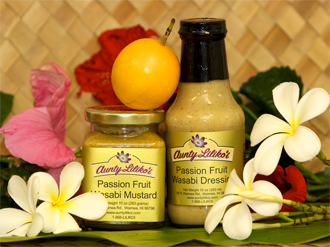 That year, Aunty Liliko’i’s Passion Fruit Wasabi Mustard was judged the best of the 312 entries from 19 states and four foreign countries. Bring home a gift of Kaua’I to your family and friends—and don’t forget to treat yourself, too!